An architectural trend: The need for refined, modern build quality answered by Tradeline trims. With the rapidly increasing need for refined design detail in modern construction, the demand for aluminium reveal trims is at its highest. Architects and Interior Designers alike are now grounding their work in achieving the highest level of finish between product transitions. With this, currently aluminium stands as the modern material of choice for the construction industry. A truly environmental material, the metal is a cut above the rest in terms of recyclability. Unlike most other materials, aluminium can be reprocessed time and time again, to the same high quality, in an almost never-ending cycle. Waste produced during manufacture can be recycled into new product, while salvaged material from refurbishment projects can also be reprocessed and reused. Tradeline Trims have been extruded, with some of the most modern machinery available, together with a state-of-the-art polyester powder coating facility. Our technical expertise, gained from years of practical industry experience is second to none, and we support this with full optimised computer aided design technology. Going further, our trims fall into two main categories: Dry-Lining and Suspended/MF Ceilings. For both product groups our trims are used to form seamless transition details. Dry lining trims are used to form reveal details within a conventional plasterboard system using single or multiple layers of plasterboard. Tradeline trims can be used in conjunction with all major brands of plasterboard, steel stud and track systems and timber framing. The feathered edge allows for a seamless tape and joint finish. Suspended ceiling trims are used to form unified transition details between plasterboard and most major brands of suspended ceiling tile and grid. Tradeline trims can be used with a feathered edge for a plasterboard tape and joint finish or standard perimeter angle finish for mineral fibre ceiling tiles both of which has seen great success in refining the build quality of work carried out. Both supplied in 3000mm lengths, extruded from architectural grade aluminium alloy to BS 1474. Pre-punched with diagonal fixing slots and holes in the plastering fin suitable for fixing by drywall screws. The standard finishes are either white polyester powder coating to RAL 9010, 20% Gloss, or chromate etch primer suitable for direct over-painting on site after fixing. Non-standard lengths, factory curving and alternative factory applied finishes are available to special order from the team directly. In terms of the Tradeline range, nearly all the trims can be curved to suit on site radius and detail. This can be done by advising the team of the radius or indeed sending a template to the factory where the trim is curved to order and size. In addition to the curved trims range, column rings are also available if necessary. For more information about our Tradeline Trims, click here. 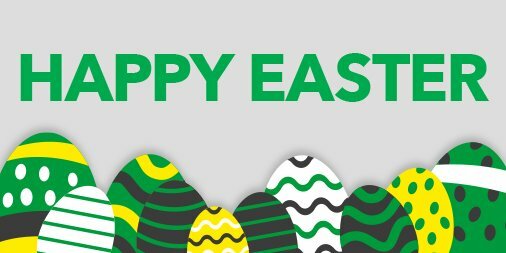 Wishing you all a very Happy Easter, from the Tradeline team!